In addition to the eleven statewide propositions, Los Angeles residents face four additional local measures (well, really just three, one of which comes in two parts). While all four have the right intentions, one leaves us with serious questions about impacts and implementation. The city of Los Angeles manages billions of dollars in taxpayer funds every year. Until recently, all of that money was stored with Wells Fargo. After massive corruption and fraud was revealed at Wells Fargo, the city rightly decided to move its money elsewhere, but limitations in city and state law required that the money go right back into large institutional banks that are rarely working in the best interest of the city’s taxpayers. 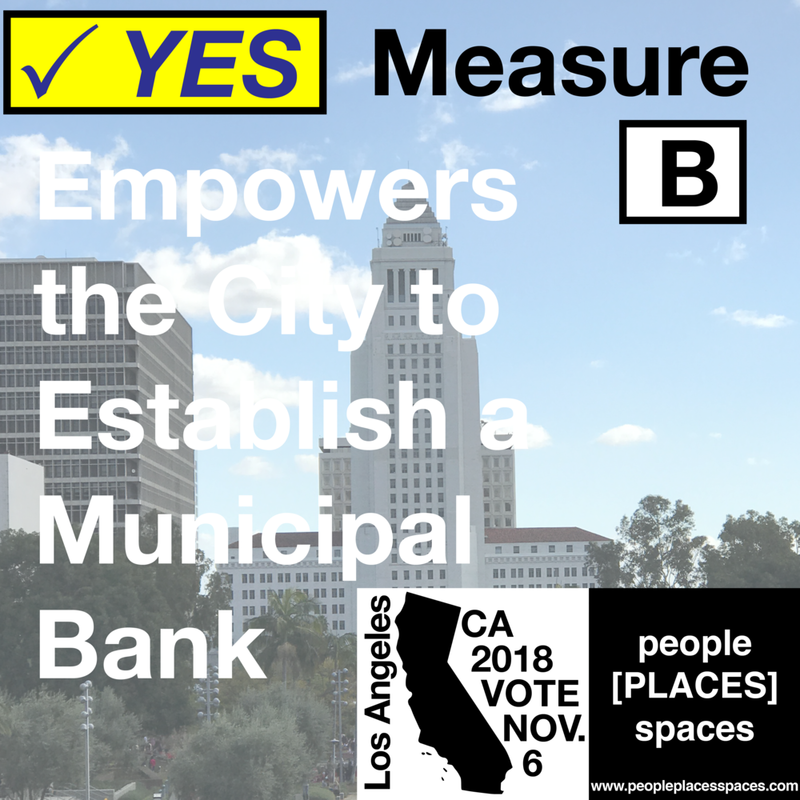 To be clear, Measure B does not establish a municipal bank, it merely empowers the city to do so if it chooses, and if state laws change to allow it. Much like Prop 7, this is only a first step in a long process. Many thorny details would still need to be worked out, but considering the banks the city is forced to do business with, Measure B is a worthy effort to bring control of the city’s money back to the city. In addition to protecting taxpayer money from the kind of fraud perpetrated by Wells Fargo, it would also prevent city funds from being invested into things the city is expressly and legally opposed to. Establishing a municipal bank would allow the city to put its investments to work for Angelenos rather than Wall Street investors, and it would allow the city to put its money where its mouth is by investing in causes that are aligned with the city’s priorities. Furthermore, a municipal bank presents the opportunity to break down the barriers that prevent many Angelenos from accessing traditional bank services in today’s banking landscape. Measure B is only the very beginning of a much longer conversation, but it’s a conversation we welcome, and a concept we are eager to support. Measure W is an elegant and admirable strategy to fund local water infrastructure and groundwater storage projects through a tax on the kinds of development that create the most stormwater runoff. The only problem is the very real potential that this is a regressive tax that will burden low-income homeowners the most. Measure W would impose a 25-cent per square foot parcel tax on all impermeable (surfaces that water can’t pass through) area on each property. This strategy makes sense because every square foot of space that is covered in concrete is a square foot of space that stormwater can’t pass through, a square foot of space that isn’t replenishing groundwater, a square foot of space that increases runoff, overburdens sewers, and flushes into the LA River to run straight out to the ocean in all it’s oily toxic effluescence. So in this sense, discouraging the concretization of Los Angeles is somewhat logical. What this measure ignores is the on-the-ground reality of Los Angeles. While this measure mostly impacts the owners of completely paved properties like surface parking lots, it also impacts homeowners who may have paved over significant portions—if not the entirety—of their properties for a variety of reasons (which may include a desire to limit water use for irrigation). From our anecdotal experience of living in LA, these paved over residential lots occur most frequently in lower income areas, whereas wealthier Angelenos are much more likely to have large areas of lawn and garden that require extensive irrigation, but are unaffected by this proposed tax measure. As far as we can find, no one has actually done the work to determine what the disparate impacts of this measure will be. Indeed, no one actually knows what the tax burden will be for each individual property because this measure implements a formula that has never been used before. Until we can be convinced that this is not a regressive tax that disproportionately burdens low-income homeowners in Los Angeles, we cannot support it, no matter how nobly-intentioned it may be. In another #TBT (can we make “Throwback Tuesday” a thing for election-related topics? ), Measures E and EE harken back to Charter Amendments 1 and 2 passed in 2015, which realigned LA’s primary and runoff election dates to align with statewide and national elections. With voter participation at pitifully low levels, it was a smart decision to move city elections to the dates voters were most familiar with. There was only one problem: after the 2016 elections, California decided it wanted a greater say in the presidential nominating contest and moved the statewide primary from its traditional timing in June to an earlier date in March. Measures E and EE will once again realign local elections (E for city elections, and EE for LAUSD elections) with the statewide primary date. Perhaps more importantly, these measures give the city council the power to adjust the local primary date to match the state, so we won’t have to vote on this a third time if the state changes its mind again. The “official” opposition that you’ll find in your sample ballot argues that we should be focusing our efforts on creating an instant-runoff or ranked choice voting system for local elections. This is a reasonable proposal, which would eliminate the need for two separate elections. But instant-runoff isn’t on the ballot, and E and EE would increase voter participation right away. It may not be the best choice, but it’s the right compromise for now.